How a Summer with the Bourne Braves Made Brendon Little a First-Round Pick! During the Fourth of July weekend in Cape Cod, an unfortunate bout with traffic forced Brendon Little to ride a little girl’s bike to the Bourne Braves game that night. While he made it to the game in one piece, the experience was not one that Little would like to replicate. Nonetheless, the left-hander has many fonder memories from his summer in 2016 with the Bourne Braves, a stint that would play a major role in him being selected No. 27 overall by the Chicago Cubs in the 2017 MLB First-Year Player Draft. Like everyone does at one point or another, Little faced adversity during his baseball career. His experience, however, is more than the norm. After being one of the most hyped players of North Carolina’s recruiting class for the 2016 season, Little threw just four innings at UNC, giving up three runs and fading to the background on a Tar Heels team filled with players that possessed major league potential. 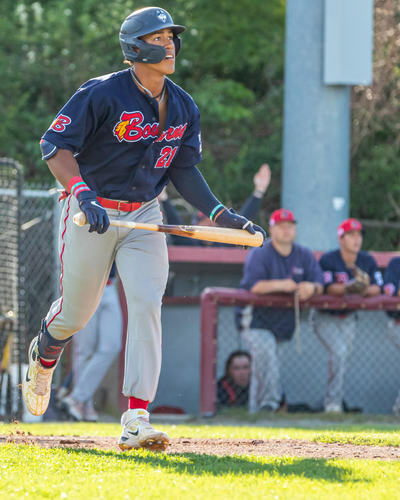 Despite his struggles, an opportunity with the Braves in the Cape Cod Baseball League opened up, and Little started training for it intensely upon the realization that he would not be pitching much with the Tar Heels. “After home games I would always go back in the gym after them and get my workouts in,” he said. “When I saw I wasn’t pitching, I treated that spring at UNC as the stereotypical fall. Lifting, trying to build up some endurance and trying to get my body ready for the innings in the summer. The Braves strategically used Little solely as a reliever during the summer, although he also considers himself a starter, and under the tutelage of pitching coach Jordan Tabakman, allowed him to grow immensely as a pitcher. Little said that the key for him to adjust to the caliber of talent on the Cape was just to get into a rhythm and simplify things. The results were positive. While his 3.68 ERA doesn’t look superb on paper, it can mainly be attributed to a couple of rough outings. In 11 of the 13 regular season games that Little appeared in, he did not allow an earned run, which made him a CCBL All-Star. However, it was the strikeout numbers that really jumped off the page. He fanned 29 hitters in 22 innings, striking out at least three in four different outings. Little credits this breakthrough to his curveball, which really came into its own during the summer. He said he came into the Cape hoping to develop a secondary pitch, and found it with his curve. Coming away from the Cape, Little was able to gain something precious besides his revamped curveball: newfound confidence. Understandably, his confidence was not where it needed to be following his season with UNC. For Little, he believes the uptick in his confidence came simply by consistently pitching and being a member of a team. Tabakman attributed the confidence more to his specific prowess on the mound. Little was able to build off of his summer into a season with the State College of Florida, opting to go the junior college route rather than sitting out a season. By the time he stepped on campus in Bradenton, he was far more prepared for the workload than he was before he started with the Braves, and it showed. Little recorded 133 strikeouts in just 85 and 1/3 innings with the Manatees. While his numbers on the field were gaudy, part of what made Little’s summer so special was the atmosphere of the Bourne organization. The Braves pride themselves on the community feel that they have, and Little felt that way throughout his time with the team. Of course his good times over the summer far outweighed memories like the bike incident. Little painted the picture of one of his favorite nights in the Cape. Overall, Little will never forget spending the summer on the Cape, crediting the Bourne organization for the time he had. For many college players, nothing beats hearing your name called in the draft. Although he maintained his cool when his advisor told him he would be selected 27th overall by the Cubs, a celebration soon ensued. Having started all 15 appearances at State College of Florida as opposed to having come in as a reliever throughout his time on the Cape, Little said his preference in the minor leagues is to start, although he is open to either option. Regardless of what role he pitches in, Little is well-prepared for minor league baseball, having used the CCBL as a stepping stone to facing hitters at the next level.